Weeds in RoundUp Ready crops fields have gradually developed resistance to the herbicide. In the USA 92% of RR cotton and soybeans are infested by uncontrolled spread of “superweeds” like amaranth. Dicamba based herbicides have caused a widespread problem caused by the product’s volatility. Damages to neighbouring soybean fields, as well as other crops and vegetation are being investigated in 17 States on a 2.5 million acres area. A recent US Geological Survey study sampled waterways in 38 states and found glyphosate and AMPA in the majority of rivers, streams, ditches, and wastewater treatment plant outfalls tested. Studies in the US indicate glyphosate residues detected in soils of crop production fields range from 25 to 1000 μg kg-1 soil. Glyphosate tends to accumulate in soil as 95% is absorbed by the soil itself or by the roots of the plant, while only 5% gets to the targeted weed. According to a European pilot study on soil contamination by the Joint Research Centre of the European Commission and Wageningen University 45% of agricultural land in Europe contains glyphosate and AMPA, the most stable degradation product of glyphosate. Pesticides are responsible for the deaths of two hundred thousand people each year, of which 99% from countries of the Global South, as outlined in the latest report by the United Nations Special Rapporteur on the Right to Food, Hilal Elver. Glyphosate was found in the urine of 93% of consumers undergoing toxicological investigation during the project, launched in 2015, by the University of San Francisco – California (UCSF). The social economic cost of the impact of neurological issues linked to pesticides use, such as lower IQS caused by prenatal exposure to agrochemicals amounts to 125bn per year, according to a study promoted by the European Union on the impact of organic food and agriculture on human health. 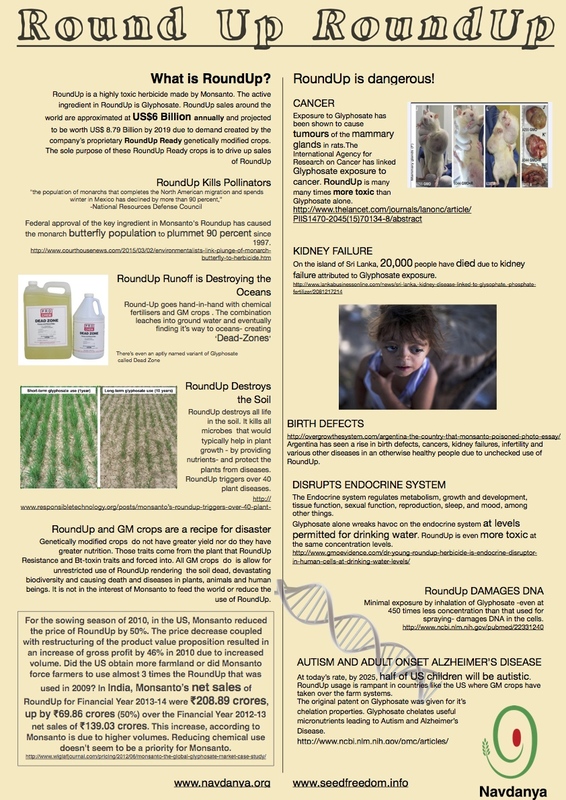 Roundup has been also linked to ‘chronic kidney disease of unknown etiology’ (CKDu) in Sri Lanka, India and Central America. In Sri Lanka, it has today become the most significant public health problem with more than 60,000 estimated patients and more than 20,000 deaths. Toxicity risk assessments of many chemical substances have been hidden from the public since the 1920s, by producers and regulatory agencies, as revealed in the “POISON PAPERS”: more than 20,000 documents released at the end of July 2017 by the Center for Media and Democracy and the Bioscience Resource Project. According to an investigation by Corporate Europe Observatory in June 2017, about 46% of the experts on the scientific panels of EFSA have a direct or indirect financial conflict of interest with the agribusiness industry. 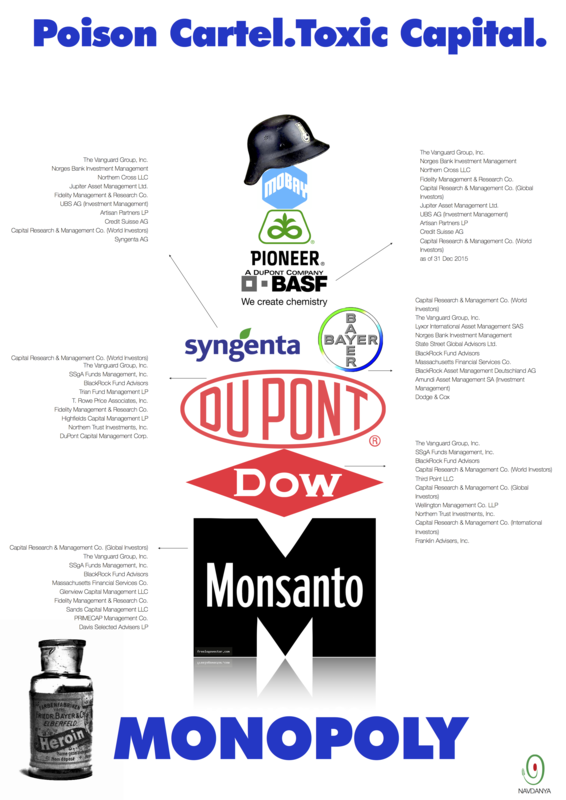 The Monsanto Papers contain hundreds of internal emails of Monsanto, as well as its correspondence with US Federal Agencies, the content of which reveals the magnitude of collusion between Monsanto and the EPA in order to undermine the investigation of the potential hazard of Glyphosate for human beings, including ghostwriting some studies fraudulently attributed to apparently independent academics. The International Assessment of Agriculture Knowledge , Science and Technology (IAASTD’s Agriculture at a Crossroads report, vol. V) has clearly shown that small agroecological farmers are more productive. The UNCTAD Trade and Environment Review 2013 Titled “Wake Up Before it is Too Late” stresses that a paradigm shift is needed from chemical intensification to ecological intensification . The United Nations Environment Programme in “Preventing Future Famines” shows how small ecological farms enhance productivity through ecological functions. Lancet , the leading medical journal has recognized that only small farms have diversity , and diversity is vital for health. As Navdanya’s work over the last 3 decades has shown we can grow enough nutrition for two times the current population (Health per Acre), we can increase farmers’ incomes tenfold by giving up expenses for buying toxic chemicals (Wealth per Acre), we can address malnutrition and chronic diseases (Annam:Food As Health), and we can create climate resilience (How Biodiversity and Agroecology create Climate Resilience). 3 Comments to "Poison Cartel Fact Sheet"